Disney's Brave is undeniably unlike any other Disney Princess film that they have produced to date. Definitely a film to add to your collection; and it's available now in one FABULOUS combo pack that is overflowing with fun bonus features! The breathtaking animation takes you on a journey through the rolling hills of Scotland and the lively storyline of Disney's first self rescuing princess, Merida. With her gorgeous fiery red locks and a tenacious personality, this is one princess that certainly breaks the proverbial mold. Merida rebuffs tradition from early on and when the time comes, she refuses to choose a suitor. The headstrong princess decides instead to follow the magical wisps that are believed to lead you to your fate. She soon learns though that attempting to guide or change fate can ultimately end in ways that she may not be prepared to handle; buoying the timeless saying "be careful what you wish for". "La Luna" is Enrico Casarosa’s stellar short about the moon’s custodians: a young boy, his father, and his grandfather. The Blu-ray, Blu-ray 3D, DVD + Digital Copy combo pack is PACKED with tons of fun bonus features that the entire family will LOVE! *“La Luna” Theatrical Short – Fans will love this charming short that accompanied the film in theatres. It follows a young boy on his first night working the family business alongside his father and grandfather.
? * “The Legend of Mor’du” Short – This rousing new bonus short film will give fans the chance to delve deeper into the legend behind Mordu, as told by the eccentric witch who transformed him.
? *Brave Old World – Fans will watch as members of the “Brave” production team investigate Scotland, exploring its land, culture, people and dialects. The research they gathered was brought thrillingly to life in thefilm. Also, fans will hear what actress Emma Thompson (voice of Queen Elinor) thinks of Pixar’s take on her homeland.
? *Merida & Elinor – With the creation of Merida and Elinor, the Pixar filmmakers delved deep into the relationship between mother and daughter. Highlighting contrasts in character design, clothing, animation, voicing, even hairstyle, watch how the filmmakers explored this most important of relationships.
? *Bears – Take a look inside the art and design behind the bears in “Brave.” Each of the bears, gentle Mum-Bear and terrifying Mor’du, demanded a different approach to creating their physical appearance and personality.
? *Brawl in the Hall – A fascinating and hilarious inside look at the process of creating “Brave’s” fighting Scots, through animation, crowd simulation and fight choreography – not to mention a room full of grunting men whose vocal chortles added authenticity to the raucous scene.
? *Wonder Moss – Fans will explore how “Brave’s” technical artists examined the real Scottish countryside and studied the laws of nature, then turned thesefindings into computer codes that would blanket Merida’s Scotland in lush moss, lichen and bracken.
? *Once Upon A Scene – A closer look at the evolution of the storylines throughout the production of the film, including alternative openings to the film and many deleted scenes.
? *Extended Scenes – Three separate scenes are highlighted in their extended form. Director Mark Andrews discusses the decision making process that led to the shortened versions of these scenes. Andrews joined Pixar Animation Studios in December 2000 and has worked on four of the studio’s feature films. He served as story supervisor on the Academy Award®-winning feature films “The Incredibles” and “Ratatouille” and as a storyboard artist for the Golden Globe®-winning “Cars.” Andrews also contributed to the story of the critically acclaimed, award-winning “Toy Story 3.” In addition to his work on Pixar’s feature films, Andrews co-wrote and co-directed the Academy Award®-nominated short film “One Man Band.” He also provided his talents to Walt Disney Pictures’ “John Carter” as second-unit director and co-writer alongside the film’s director and Pixar colleague Andrew Stanton. Prior to coming to Pixar, Andrews lived in Los Angeles and was a storyboard artist on several animated films. For his work on “The Iron Giant,” he received an Annie Award from ASIFA-Hollywood for Outstanding Individual Achievement for Storyboarding in an Animated Feature Production. He was also a storyboard artist on several animated television shows such as “The New Adventures of Jonny Quest” and “Star Wars: The Clone Wars,” for which he was awarded an Emmy®, and the award-winning “Samurai Jack.” Besides his work in the animation world, Andrews was a storyboard artist on Sony’s blockbuster live-action feature film “Spider-Man.” Andrews earned a Bachelor of Fine Arts in Film from the California Institute of the Arts (CalArts) in 1993. He currently lives in the Bay Area with his wife and their children. We’re in very good company and I’m surrounded by fantastic mentors. Their wealth of experience was always ready at hand and helped me become a better filmmaker. What I love about Pixar films is that we’re always trying to push the envelope and not be formulaic. With “Brave,” we’re telling a story that audiences are going to get wrapped up in. We put a lot of honesty into making this film. At the end of the day, I’m proud of the work that we’ve done—I’m proud of the difficult times and I’m proud of the good times, because I didn’t go through it by myself, I had a lot of good, talented people going through it with me—great warriors by my side. Q: What is “Brave” about? In a nutshell, “Brave” is about a young woman named Merida and her struggle to find herself—to reconcile how the world sees her with how she sees herself. The most important thing to Merida is her bow and her horse and the free time that comes with them. So she’s a phenomenal archer. She loves to be outside racing around the Scottish countryside on her horse Angus. Merida’s relationship with her mother, Queen Elinor, is broken. They have their differences about what’s expected of Merida and the responsibilities that come with growing up. It’s all about changing your fate. And Merida—feeling the constraints of castle life tightening around her—desperately wants to change hers. The main theme is being brave, finding the courage to let go. Merida is a very brave character—she climbs cliffs, shoots arrows, fights bears—but it’s really that bravery of the heart that’s the hardest. Q: Can you relate to the film’s family themes? I have a daughter and three sons, just like Fergus and Elinor. It’s a parent-child relationship that’s at the core of this film—mothers and daughters or dads and sons, it doesn’t matter. The future doesn’t mean anything to any teenager, especially to Merida. There’s a chemical thing in teenagers to fight back—they want to figure out the world for themselves. [They] are burgeoning, becoming the adults they’re going to be and that’s the really chaotic transition that’s all through this movie. I was a kid, so I get the other side, too, when you just want to be left alone and find out the answers for yourself. A great truth of the universe is that no matter how much we as parents advise or help our children, they’ve got to make their own mistakes just like we did. And we have to suffer through the pain all over again watching them do it. Q: What makes the movie special? In “Brave,” we’re really pushing the envelope in terms of cinematography, lighting and photography. We found new ways to create texture and took human characters to the next level. The movie has unprecedented subtlety in its performances. This film is very rich—it’s very tactile. The thing about “Brave” is that you want to reach out and touch it, you want to feel everything in the movie from their gowns and kilts to the big red mess of curls on Merida’s head. That’s what brings a special kind of warmth—a personal connection—to the big screen. When audiences go to “Brave,” they’re going to get this great, emotional, character piece about this parent/child relationship, and they’re also going to get a great adventure. They get to travel to Scotland and see magic like they’ve never seen before. There’s comedy, passion and wonderful characters. It’s a fantastic ride. Q: Is there a bit of Kelly Macdonald in Merida? Kelly is so alive and vibrant with a great charm, wit and quirkiness that totally works for Merida. The character is funny and goofy and can laugh at herself, but has this Scottish teenage angst. Kelly Macdonald is the soul of the character and she makes Merida truly appealing. Elinor is a Queen, bar none. She is the ultimate authority, she’s the diplomat, she’s the lawmaker. She handles everything in the castle from planning the feasts, to entertaining guests, to setting all the rules. She’s doing what she feels is the right motherly thing in her efforts to prepare Merida as well as she can for the future, but she doesn’t realize it’s at the expense of their mother-daughter relationship. Emma [Thompson] is royalty in the acting world and she [knew] exactly what Elinor needed to be. She is queenly and regal and noble, but at the same time, she can be bawdy and funny. She can be very serious and theatrical—then crack a joke. That’s exactly who our queen is. Emma gives Elinor just the right amount of emotion, earthiness and humor. Fergus is this immense Highland warrior—the kind of guy who wears a bear cloak. He’s loud and boisterous, kind of like me, and full of guts and wisdom. He lost his leg to the demon bear Mor’du and will tell the tale to anyone whether they’ve heard it or not. I have a great affinity for Fergus because I’m just a big kid. He’s gregarious and open and there’s no rules for him, which puts him on a very different level than Elinor, who’s actually running the kingdom. When it comes to his daughter, his wife and his little boys, there’s also this soft side to Fergus. He is a great dad, he’s fun to be around and he tells the kids stories and plays with them. Merida’s relationship with King Fergus is a special one. They’re really close as father and daughter; they’re very similar. Merida’s very brave and speaks her mind and is loud like Fergus. They both have red hair and would never shy away from a fight. They both like to tell stories. Billy [Connolly] is exactly like Fergus in that he’s this gregarious comedian, who’s smart as a whip, has a great wit and just wants to tell stories all the time. The recording sessions were a riot—like life imitating art—we would take a break and get a half-hour of incredible story time with Billy. It was just hilarious. The Lords are the leaders of the neighboring clans. They don’t like each other, but they pretend to like each other in front of Fergus and Elinor. They’ll brawl at the drop of a hat and it’s up to Fergus to settle them all down—though he’s more inclined to join the fight himself. Lord Macintosh is a skinny guy with curly hair and a big blue painted tattoo on his face. He’s very surly, and becomes an aggressive pit-bull at the blink of an eye. His son has long flowing locks and a temper that makes him quick to fly off the handle just like his dad. Lord MacGuffin is huge—a descendant of the Vikings. His eyes are hidden beneath heavy brows and his voice comes out like a big thunderclap. His son is just like MacGuffin, but with a baby face and he speaks a dialect that’s impossible to understand. Then you have Dingwall, who’s the shortest, oldest and most haggard of the lords, but he was fearsome in his time. He’s like that cantankerous old guy who sits on his porch and yells at the neighborhood kids, “get off my lawn!” That’s Dingwall. Wee Dingwall is his guileless and awkward son. Q: Who are the triplets? [The triplets] run around the castle, causing all matters of chaos and getting into trouble. They’re constantly a plague to their nanny, stealing all her sweets and escaping scot-free through some nook or cranny in the castle. They play practical jokes on Fergus—and anyone else they can find. Q:What are the will o’ the wisps? The will o’ the wisps are in a lot of Scottish folklore. They were said to lead you to treasure or doom—to change your fate—but they’re an actual phenomenon of swamp and bog gas seeping up through the earth and interacting with the natural resources to create the blue flames. People would follow these lights thinking they were little fairies, and basically drown or get sucked down into the bogs. [So] we made the wisps like actual little spirits. They appear when Merida needs them most—when she’s in an intense emotional state and a big transition is going to happen. Merida has a big argument with her mother and she gets on Angus and rides out into the woods. They end up in a ring of these giant, monolithic stones that form a perfect circle. It’s in that circle that Merida first sees the will o’ the wisps—these blue mythical creatures that look like little floating flames and whisper in this mesmerizing way. They line up like little landing lights and beckon her to follow. They’re almost like Marley’s ghost in a way, because Marley’s ghost isn’t an evil spirit—even though he’s frightening, he’s trying to warn Ebenezer to change his ways. That’s what the wisps are doing. There’s a duality to them, because they’re either good or evil—they lead Merida into more and more trouble, but in the end, they’ve led her exactly where she needs to go. She’s this little old hippie grandma who does wood carvings—all bear-themed carvings—rocking chairs, mugs, pipes. She’s really a witch who gave up witchcraft because of too many unsatisfied customers. Merida gets her over a barrel and insists on a spell to change her mom so she can change her fate, because she thinks her mom is the only obstacle. Of course it goes, terribly, terribly wrong. Q:Why is Scotland such a great setting for “Brave”? Scotland is just filled with myths and legends. It’s a magical place—rugged and majestic. The colors there are dark and moody and, at the same time, bright and cheery—all thanks to the crazy weather. The people are hospitable, warm and friendly, and they take you in right away. They’re all fabulous storytellers. I’ve never been so enraptured and terrified by heroic tales and ghost stories. One of the things we really wanted to emphasize with “Brave” was that every character is a storyteller in his own right and every location has a story. The look of the film is gorgeous! Steve Pilcher, who’s the production designer, and his team really captured the diverse and weathered Scottish environment—from the heather in the Highlands to the giant Gannet Scotch Pines in the forest to the scoring on the standing stones. When you go and watch “Brave,” you’re not just going to see a movie, you’re going to be in Scotland. I am Scottish—on my mother and father’s side. We came over hundreds of years ago, so it’s all but bred out of me, but my wife and I went there on our honeymoon and spent a month exploring the Highlands. It is a pretty amazing place. Who is "Brave" in Brave?Merida is very brave, Elinor and Fergus are brave, the triplets are even brave. There’s a lot of great action that shows courage in a traditional way. But I think the bravest people are the ones who own up to their mistakes and face what they don’t want to face. In Merida’s case, it’s about accepting this life that she needs to face. She has duties and there are expectations of her that keep the kingdom at peace. So for her to be truly brave, she’ll have to assume responsibility and admit that she was wrong. That’s not easy! 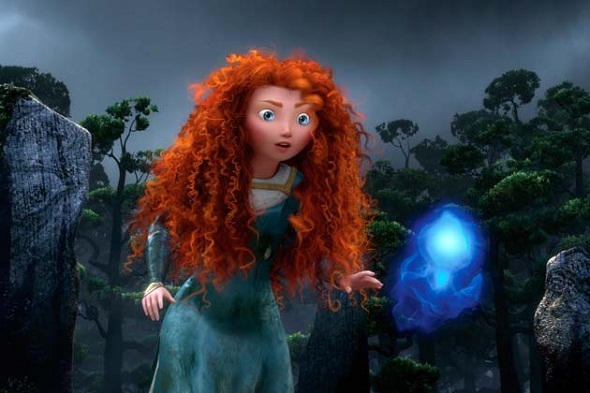 How does “Brave” fit into the Pixar roster? “Brave” fits perfectly within the cannon of Pixar films because every Pixar film is different. From superheroes to rats that can cook, to an old guy, bugs, fish, talking toys and robots. That’s why I love Pixar. I can honestly say “Brave” is unique—just like every other Pixar film. Set in the rugged and mysterious Highlands of Scotland, Disney•Pixar’s “Brave” follows the heroic journey of Merida (voice of Kelly Macdonald), a skilled archer and headstrong daughter of King Fergus (voice of Billy Connolly) and Queen Elinor (voice of Emma Thompson). Determined to change her fate, Merida defies an age-old custom sacred to the unruly and uproarious lords of the land: massive Lord MacGuffin (voice of Kevin McKidd), surly Lord Macintosh (voice of Craig Ferguson) and cantankerous Lord Dingwall (voice of Robbie Coltrane), unleashing chaos in the kingdom. When she turns to an eccentric Witch (voice of Julie Walters), she is granted an ill-fated wish and the ensuing peril forces Merida to harness all of her resources—including her mischievous triplet brothers—to undo a beastly curse and discover the meaning of true bravery. Directed by Mark Andrews and Brenda Chapman, and produced by Katherine Sarafian, “Brave” is a grand adventure full of heart, memorable characters and signature Pixar humor. Brave would make the perfect holiday gift! Also, a great pick for your next family movie night! You can find Disney•Pixar’s Brave at retailer's nationwide on Blu‐ray™ Combo Pack, HD Digital and On-Demand.